Can cycle exergaming increase brain function in seniors with diabetes? German researchers wanted to know if exergaming was as effective at increasing BDNF levels as a regular cycle ergometer. Similar heart rates but lactate threshold levels were higher in the cycle group. BDNF and VEGF were increased to similar levels post-exercise. Which gaming platform did they use? 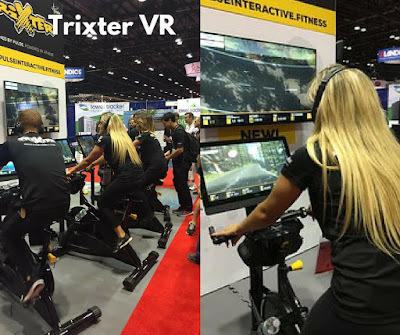 Was it one of the cycle exergames or exergame bikes? Did they have social connections to others including in other locations? 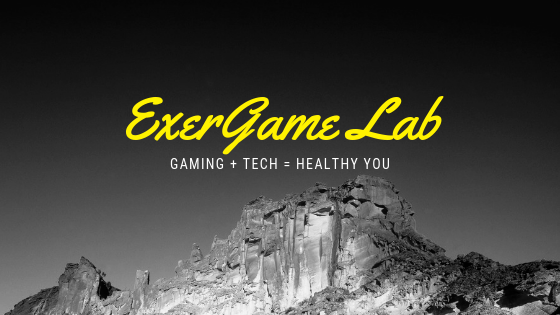 Were there gamification features like leaderboards, and points and challenges across the individuals? Patients with type 2 diabetes mellitus (T2DM) are at increased risk of developing neurodegenerative diseases. There is growing evidence that repeated exercise-induced transient increases in neurotrophic factors can augment neurogenesis and neuroplasticity. 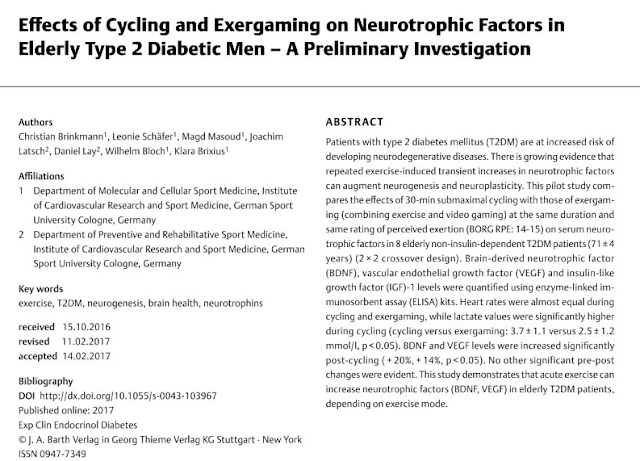 This pilot study compares the effects of 30-min submaximal cycling with those of exergaming (combining exercise and video gaming) at the same duration and same rating of perceived exertion (BORG RPE: 14-15) on serum neurotrophic factors in 8 elderly non-insulin-dependent T2DM patients (71±4 years) (2×2 crossover design). 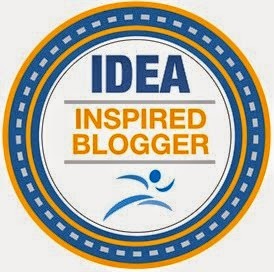 Brain-derived neurotrophic factor (BDNF), vascular endothelial growth factor (VEGF) and insulin-like growth factor (IGF)-1 levels were quantified using enzyme-linked immunosorbent assay (ELISA) kits. Heart rates were almost equal during cycling and exergaming, while lactate values were significantly higher during cycling (cycling versus exergaming: 3.7±1.1 versus 2.5±1.2 mmol/l, p<0.05). BDNF and VEGF levels were increased significantly post-cycling (+20%,+14%, p<0.05). No other significant pre-post changes were evident. This study demonstrates that acute exercise can increase neurotrophic factors (BDNF, VEGF) in elderly T2DM patients, depending on exercise mode.